On Monday mornings there is an inclusive dance group happening in collaboration with a local non-profit organization. at 813 Darwin Ave. in the Garth Homer Society auditorium. Mondays from January 21 to March 18 (*no class February 18 stat holiday). There will also likely be an event for International Dance Day on Monday April 29th, as well as classes from May 6 to June 24 (*no class May 20 stat holiday). Circle of feet by the Wellspring Dancers. 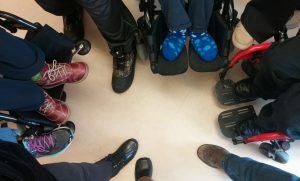 An inclusive dance group, bringing together participants who are interested in teamwork, moving creatively, and respecting each other’s boundaries. The group will focus on: exploring inclusive dance concepts, collaborating as a group, and developing skills in movement improvisation. Facilitated by Joanne, who works full-time facilitating dance groups with people with diverse ways of moving, perceiving and interacting. There are two fee options: either $10 drop-in, or sliding scale $2-$10 (pay-what-you-can-afford) per class. If cost is a barrier, please be in touch about a scholarship or a work-trade position. If you would like to be part of the Monday morning dance group, please be in touch with Joanne.